ORANGE COUNTY -- An Orange County family says it's being forced to live with recurring mold and exposed wiring in their condo. 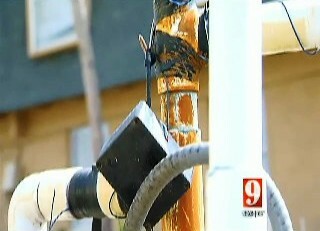 Channel 9's Myrt Price learned that a dispute between Orlando Utilities Commission, and condo management is leaving residents in limbo. Some residents of the Los Robles Condominiums said they couldn't take it any more, so they reached out to Channel 9 for help. Price said he saw what appears to be mold, cracks in the ceiling, outlets with exposed wires and other conditions that residents said need to be fixed. Filmore said she has complained about the mold before and instead of permanently taking care of it, property managers opted for a quick fix. "They bleached it and painted over it," said Filmore. Filmore said she believes the conditions are causing health problems for her family. Several of the residents said that over the past few months, their electric bills have been sky-high. The bill for one three-bedroom unit was been close to $600 for just one month. "There's something wrong with these apartments," said Filmore. People said it's been tough to pay the huge bills. They said property managers blame OUC, and OUC said it's an issue with the building. Residents told Price that OUC crews are supposed to come out this week to address the issues. The tenants said if they could, they would move out immediately. "It just makes me feel like I should have moved somewhere else," said Filmore. Property managers showed up while Price was speaking with condo residents but refused to discuss conditions at the complex. Residents said a lot of people are afraid to speak out about the conditions. Orange County Code Enforcement is expected to be at the condo complex to check on conditions Wednesday.